Stuffed peppers (Ardei Umpluti) are a favorite meal in many parts of the world. They are easy to make and delicious. 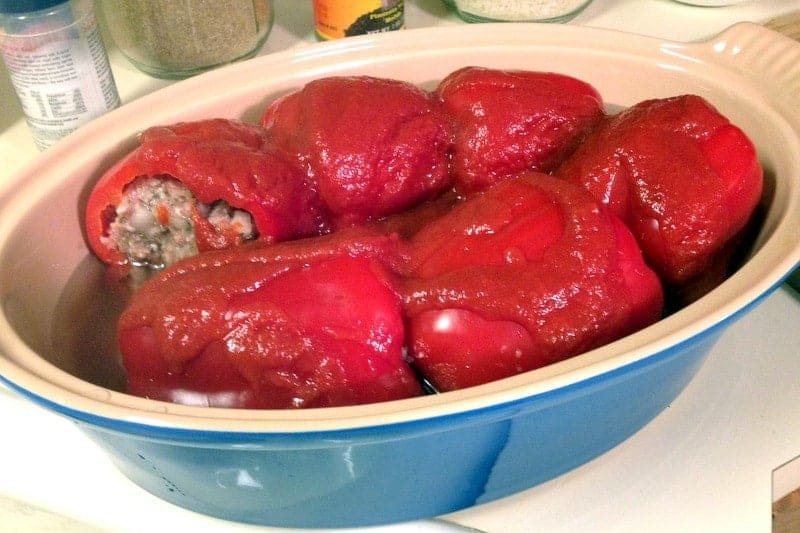 Perfect for lunch, or for a great family dinner, stuffed peppers can be served by themselves or right next to mashed potatoes or other vegetables. 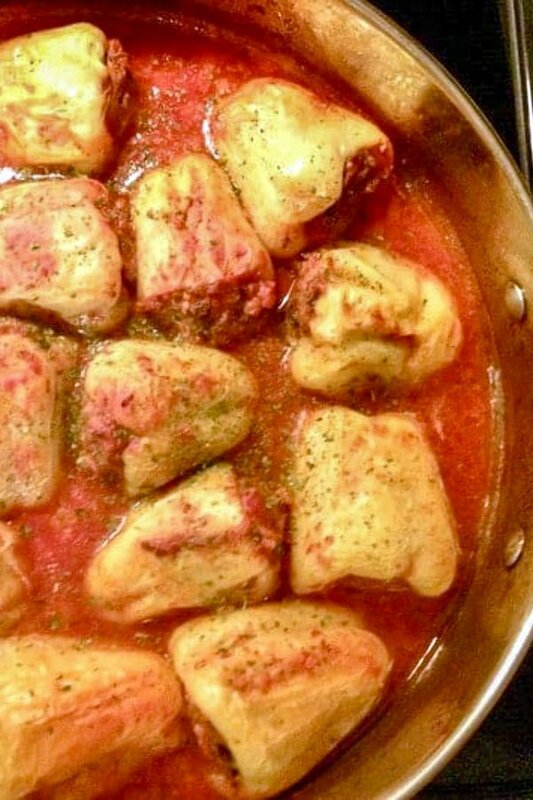 The recipe that I am going to share with you today is coming from Romania and it is a recipe I grew up with. 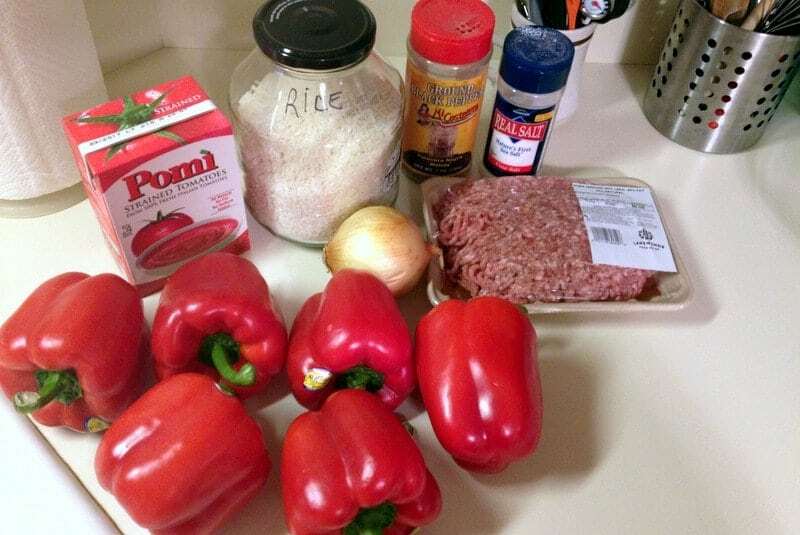 I like this recipe with ground pork, but this is not written in stone as you can use ground beef, if you prefer, or a mixture of both. 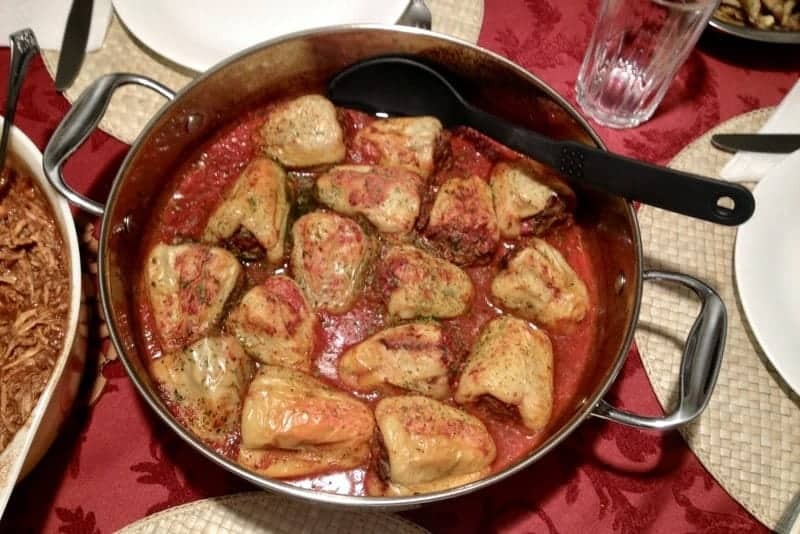 In my opinion, just like the stuffed cabbage rolls or meatballs the peppers taste better with pork, because of the amount of fat in the meat. 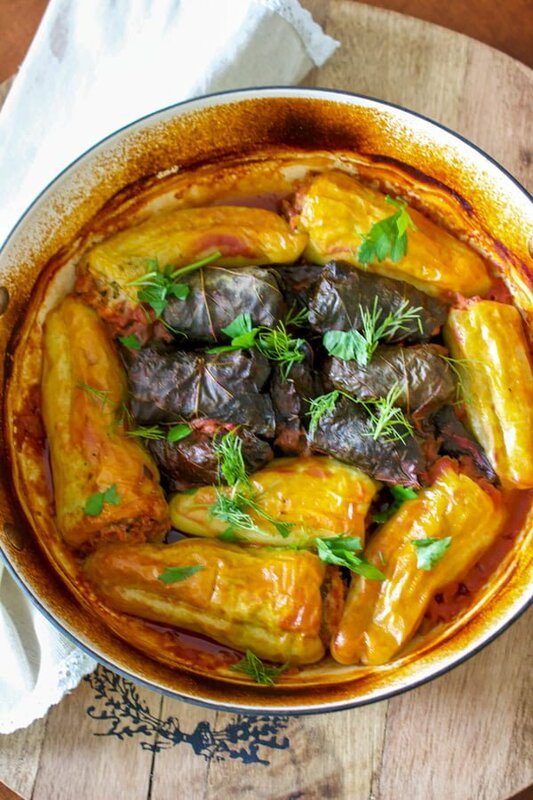 If you are a vegetarian, you can definitely still make them only with rice and herbs, but you can also add chopped mushrooms for a protein bonus. 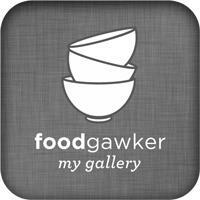 I use either sweet red bell peppers(any color works fine) or Cubanelle, if it is available. I like the red bell peppers because they are sweeter than the dark green ones and less acidic. The original recipe is made with a type of pepper that resembles the Cubanelle Italian pepper. 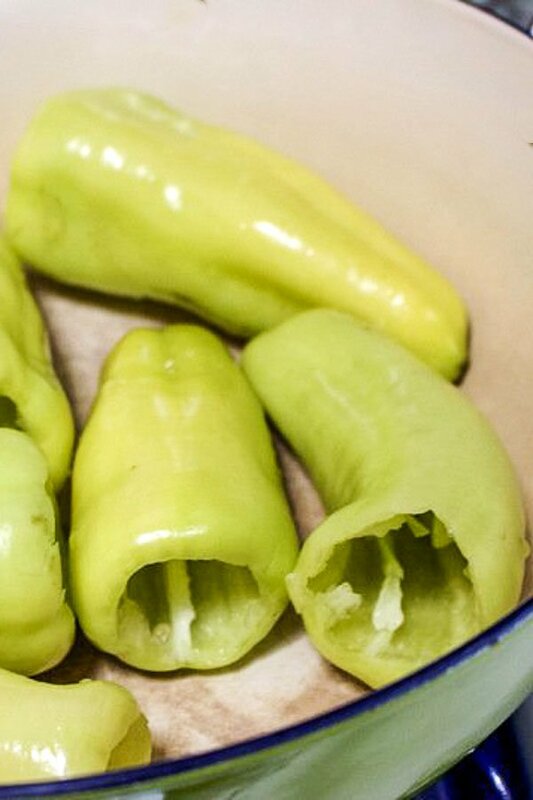 These peppers are sweet, light green and longer in size than the regular bell pepper we know in the US. These are the Romanian peppers we use most of the time in our cooking. 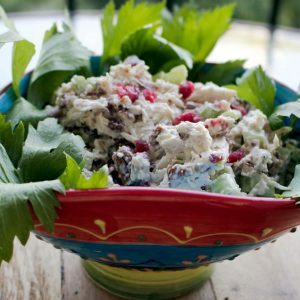 They can be also found in the Hungarian cuisine where they are very popular. 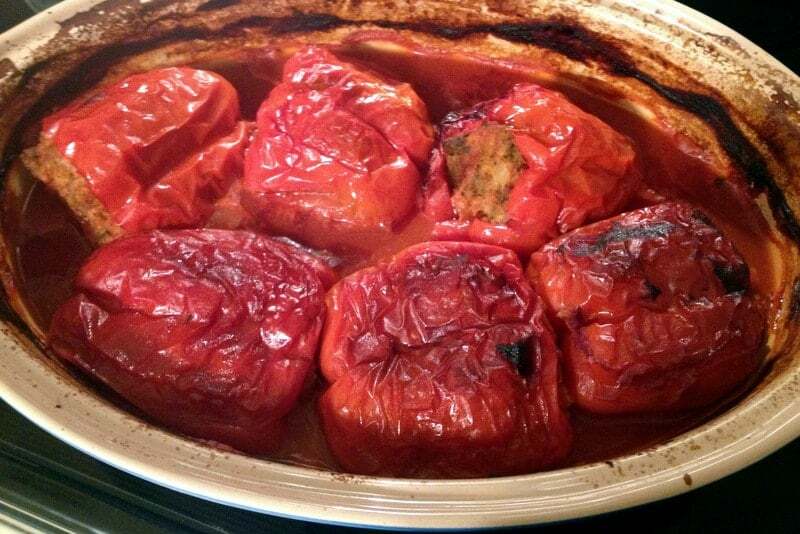 These beauties are filled with ground pork, beef or a mixture of them, rice and herbs, and swim in a delicious tomato sauce. The dish is baked in the oven, so your house will smell awesome too. You can definitely make them on the stove, but in my humble opinion, baked are much better. First, I gathered the ingredients. I cut the top of the peppers, removed the seeds and set them aside. I mixed the meat with onion, rice, spices and a little bit of water to obtain a paste. Finally, I filled them up with the meat mixture. Close up. 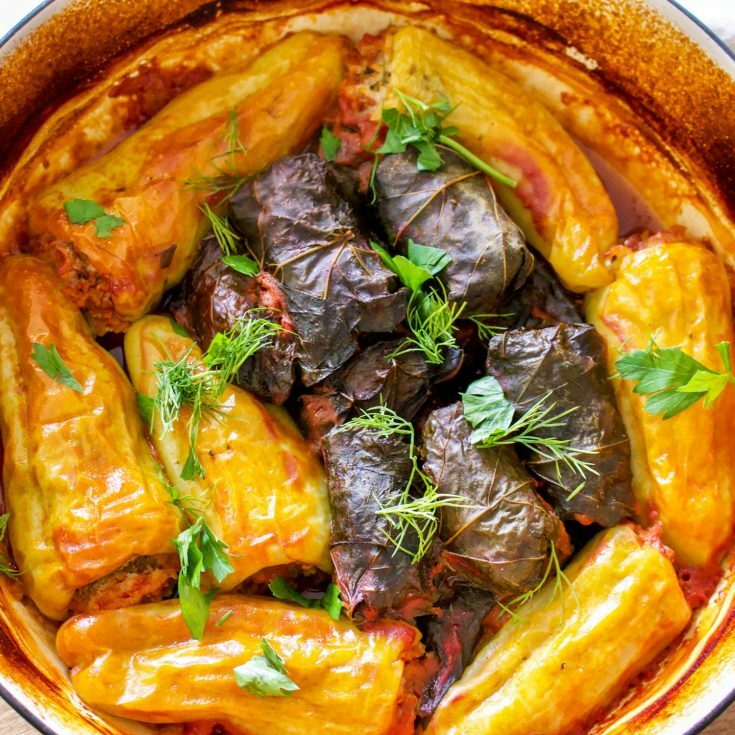 🙂 The stuffed peppers already look delicious, don’t you think? I accommodated the peppers in a baking dish and made a sauce out of tomato paste, water, salt and pepper. I poured that sauce over the peppers. I covered the pot with a lid, but you can use aluminum foil instead. I put the peppers in the oven and let them cook for about an hour. When you cook them like that, the peppers take the flavors of the rest of ingredients and end up tasting delicious. I took them out of the oven and flipped them on the other side, then back in the oven without a cover. You just want them to get a nice golden brown color and the sauce to reduce a little bit. This is a picture I took on a different occasion when I used the Cubanelle peppers, much smaller than the bell peppers you saw previously. 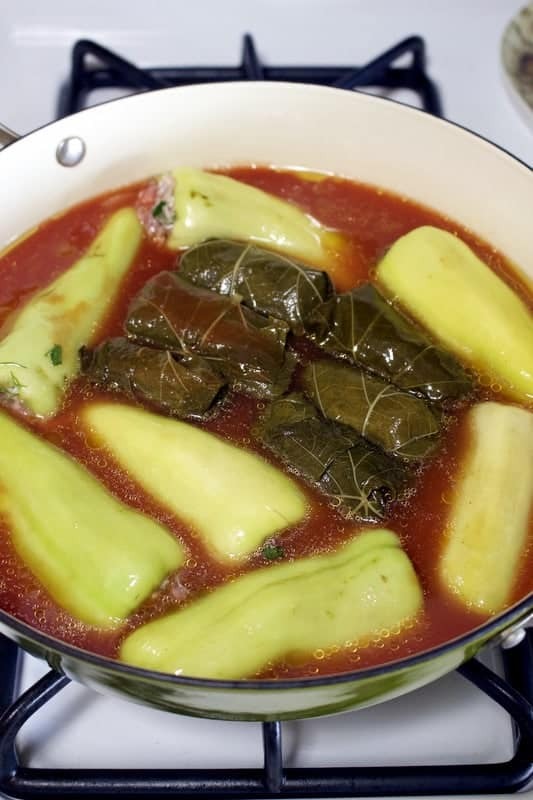 Here is another time when I also used the left over meat to make few stuffed grape leaves and cook them together with the peppers. They are ready when a fork goes easy through the skin of the pepper and when the meat and rice are cooked inside. You serve them warm with sour cream on top. 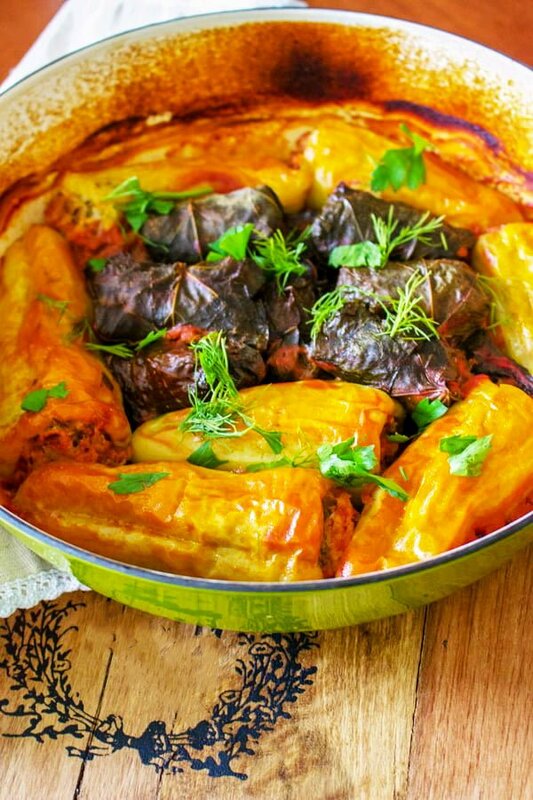 Yes, the traditional Romanian stuffed peppers are served with sour cream. 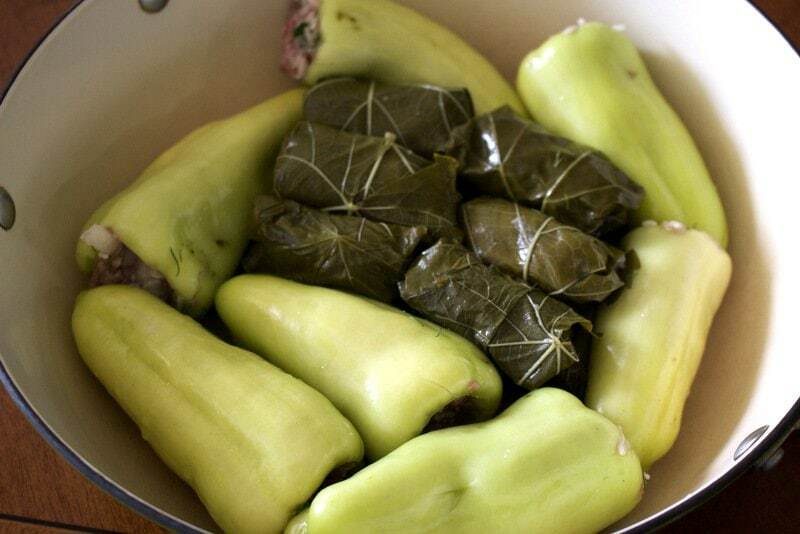 Sour cream is used in a lot of Romanian dishes, soups, stuffed cabbage rolls, stuffed grape leaves etc. 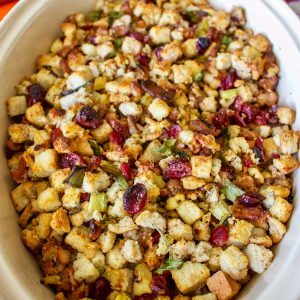 You can also serve some mashed potatoes to this scrumptious dish. 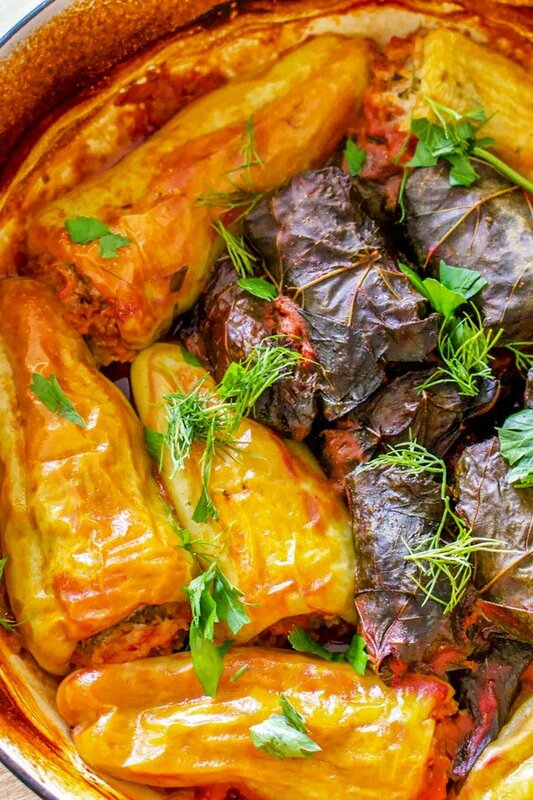 My paternal grandmother who used to live in Transylvania used to serve them like that. The tomato sauce was also sweet, because of her German heritage. You can skip the sour cream, but believe me, you have to try the peppers with it! So much better! If you noticed, we also don’t add cheese to the top of the peppers. We like them simple, as we really believe that less is better! 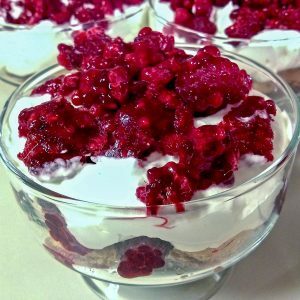 Enjoy and drop a note to tell me if you made the recipe and what you thought. 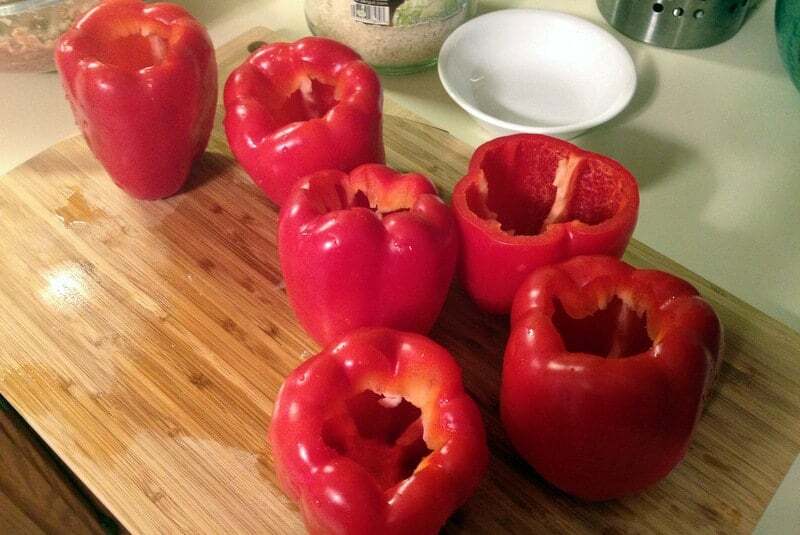 Follow the same steps on filling up the peppers. Place them in the Instant Pot. Mix together: 1 cup of water with 1/4 cup of tomato sauce, 1 teaspoon salt, 1/4 teaspoon ground pepper, 1/2 teaspoon marjoram or thyme. Pour this sauce over the peppers. Close the lid, turn release vent to Sealing and press Pressure Cooking for 20 minutes on High. 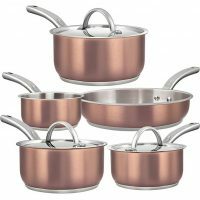 The pot will take about 10-15 minutes for the pressure to build up, which is not included in the 20 minutes cooking. 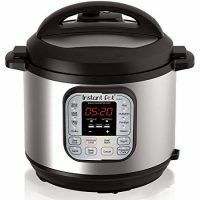 If you have an Instant Pot, I encourage you to try the recipe, especially if you are in a hurry but still want to eat a good meal. Stuffed peppers(Ardei Umpluti) are a favorite meal in many parts of the world. They are easy to make and delicious. I like to use any ground meat available, but pork is my favorite. 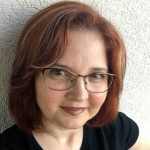 You can use a mixture of beef and pork, or just beef. Rice is also added to the mixture. 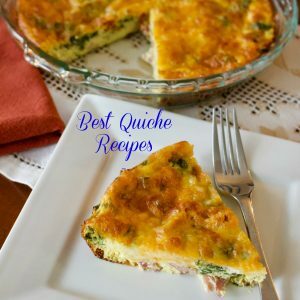 Perfect for lunch or a great dinner. 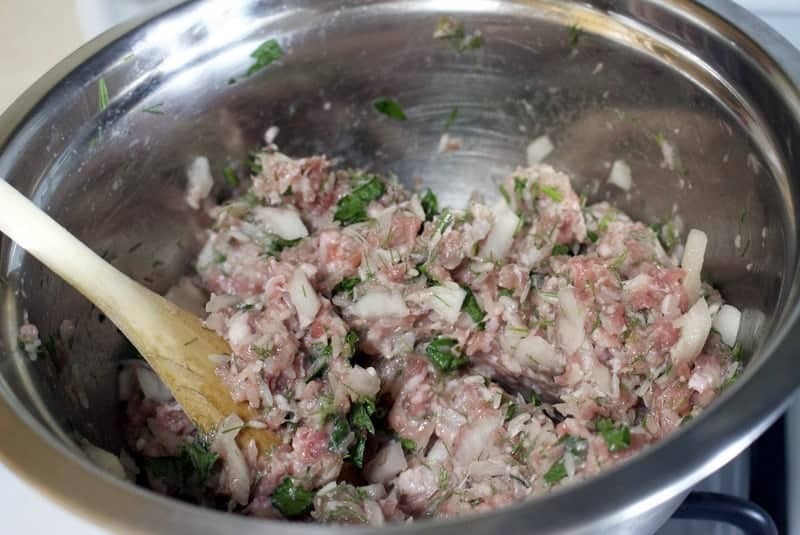 In a bowl, mix together the ground meat, rice, onion, dill, parsley, salt and pepper and 4 tablespoons water. Clean the peppers and cut a hole around the stem removing the seeds. 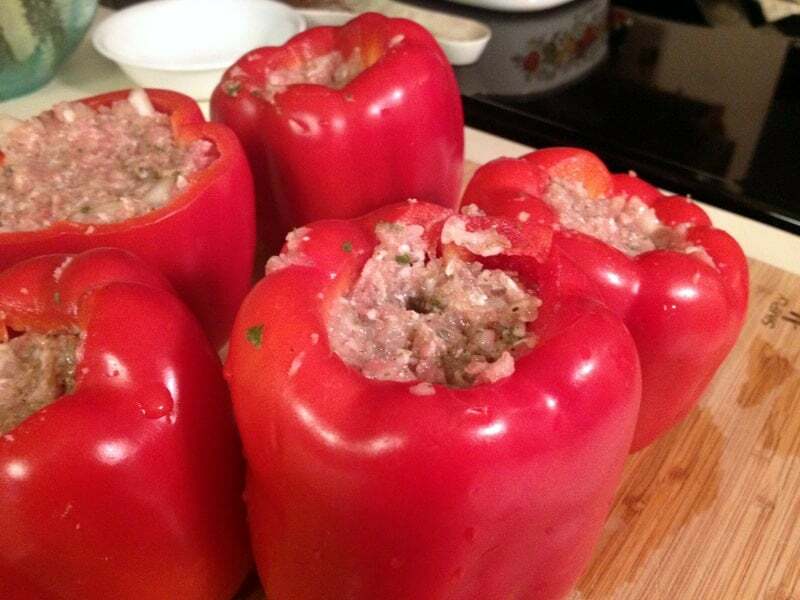 Fill up the peppers with the ground meat mixture and put them in a baking dish. Mix the rest of the water, tomato paste, salt, pepper and spices and pour it over the peppers. Cover the baking dish with a lid or aluminum foil and put the pan in the oven to simmer. After an hour, take the pan out of the oven and flip the peppers on their other side. Place the pan back in the oven but without a cover. Let the peppers bake for another 30-45 minutes or until they get golden brown on top and the sauce is reduced a little bit. Taste for salt and pepper again. The peppers are ready when the fork goes easy through the skin of the pepper and when the meat and rice is cooked inside. Serve them hot with sour cream on top. Follow the steps on filling up the peppers.